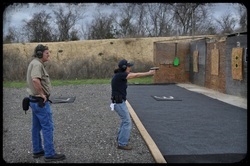 Once an individual has purchased a handgun and has acquired the basic skill sets of running the gun, it is time to begin learning how to fight with the firearm. 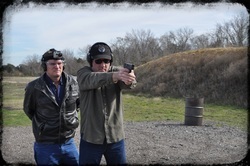 No matter if the defensive weapon is a hand, foot, blade, or gun, the operator needs to be proficient in the use of that tool in self defense. After a fundamental shooting exercise is conducted to verify basic weapon system functionality, the work begins. In other words, I just need to make sure the Indian is comfortable and mostly competent with his/her Bow. Safety Review - lasering, indexing, eyes-ears, etc. After completing this Level l course, the student will begin to understand how intensive training breeds the desire to improve. Aim small - Miss small. Consistency is everything. The amateur trains to get it right while the professional trains to never get it wrong.